CPN (Maoist Center) Chairman Pushpa Kamal Dahal has said that the next meeting of the task forces of the two parties for party unification would finalize all issues in order to announce party unification on April 22. Speaking at a condolence assembly of Dahal’s brother-in-law, Maha Prasad Poudel, organized here Thursday, Dahal said that the next meeting to be held between the two parties once he returns Kathmandu on Friday would give final shape to the party announcement. He further said that there was no dissatisfaction in the proposal prepared by the Party Unification Coordination Task force. 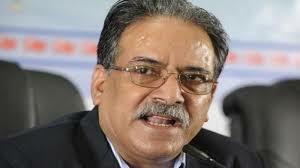 Dahal said that the party unification would be finalized after holding some discussion on statute. Saying the news disseminated in some media is only rumor, he clarified that there was n disruption in the motion of party unification. He added that the people’s expectation from left alliance would be addressed. The CPN (MC) Chairman said the government would bring policy and program and new budget soon that would give new motion in development construction.